For this week’s Ask a… blog post, we decided to catch up with Pastor Ben and learn more about what life is actually like for a pastor! If you missed last week’s interview, check out Ask a…Beijinger with Serene here. Thanks so much for taking to the time to chat, Pastor Ben! To start us off, can you tell us a bit about where you serve and what do you do there? 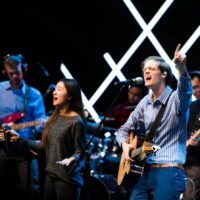 I serve at the Beijing International Christian Fellowship (BICF) City Church, and am the worship and young adults pastor. That means that I’m responsible for all the music and production elements (lights, projection, camera, etc), and also for The Embassy young adult group, which meets every Thursday night. Well, I am not actually an ordained minister. I went to a Christian university and studied some Bible and theology, but never received any official certification. I was given the title “worship pastor” when I came to BICF in 2013, so I have been doing the work of a pastor for about 5 years. Though you never went through ordination, why did you decide to become a pastor? I remember when I was probably 5 or 6 someone asked me what I wanted to be when I grew up, and I answered, “A preacher!” I think this response came from of a misunderstanding—I thought that if you really loved Jesus and wanted to be close to God you had to be a pastor, but as I got older I realized that this is not true. We need people who are fully devoted to Jesus in every single area of society. So, I can’t say that I ever felt God “call me” to be a pastor, or even that I really wanted to be a pastor; God called me to get involved at BICF, and gave me the opportunity and desire to serve this community in a pastoral role. I may continue to serve in this kind of role forever, or it could just be for this season. As you’ve mentioned, you serve in a variety of capacities and have lots of responsibilities within each of those. With all of that that, what’s your favorite part about being a pastor? I love seeing God at work in people’s lives. Just the other week I had lunch with a guy from our church who told me his story, which involved being scammed into moving to Beijing under false pretenses, and ending up here knowing no one and having almost no money. He heard about the church, and ended up getting plugged into the community, finding a job, and now he told me that God has blessed him with even more resources and relationships than before he came. It is a privilege to get to witness God’s faithfulness in people’s lives. On a different note, what are some components of your role as a pastor that people are often surprised to find out are part of the job? People are often surprised at all the behind the scenes and administrative tasks that pastors do. I’ve met some people who think that pastors only work on Sunday mornings. Haha! Preparing for worship, sermons, events, and coordinating the various volunteer teams requires a ton of time. In fact, some weeks it can be difficult to not spend 100% of my time just on all the admin tasks that need to be done. Wow! You sure have a full plate, so I’m not sure if this is even an answerable question, but what does a normal day look like in your role? It really depends on the day. Monday is my day of rest, and I try to spend it in prayer and play. Tuesday through Thursday I typically spend the morning doing emails and admin, then I’ll often have a lunch meeting with one of my volunteer leaders or just a member of the church community, then in the afternoon we often have meetings and I’ll also spend time choosing/arranging songs or preparing to preach. I try to reserve Fridays for creating music, and on Saturday morning we have rehearsal for Sunday worship. What are some of the difficulties of working in a church environment? When doing ‘spiritual things’ is part of your job it can become mundane, and it can be difficult to engage in spiritual disciplines in my own personal life. It can also be really easy to get stuck in the ‘Christian bubble,’ and lose touch with what is going on in the broader world. It takes great intentionality. Honestly, there have been times over the past five years where I have been guilty of staying in the bubble, but Jesus has called us to be light and salt – two things that are designed to go out and change the environment around them. What use is a light hidden under a bowl, or salt that has lost its flavor? Right now my wife and I are part of a book club in which we are the only practicing Christians, and I also play in a local band, which gives me lots of opportunities to be around non-Christians. You also mentioned how it can be difficult for you to maintain your own spiritual habits when it can seem like that is already your full time job. So how do you balance preparation for the purpose of church with your own reading/study of the Word and time spent with God? Honestly, they often go hand in hand. Bill Johnson (a pastor in the US) says you should never study scripture just to teach it; instead you should study to learn and then teach out of what you are learning. I can’t tell you how many times the lord will be dealing with me about a certain issue and then the opportunity will come to teach on a similar topic. For me the most important thing is my heart posture: if I love Jesus and stay hungry to know Him and make Him known, then the balance you mentioned will be fine. The danger comes when I start treating bible reading, prayer etc. like items on a checklist that I have to do. If I slip into that mindset things do not go so well. I imagine as a pastor you have lots of people coming to you with lots of questions, many that are probably rather difficult and challenging. How do you handle difficult questions people may come to you with that you don’t know the answer to? I think the most important way to face tough questions is with humility. I do not have all the answers, but I know who does, so I try to just point to Him. Beyond that I try to look at the context and discern the root of the question. Usually there are complexities behind a question that are deeper than the intellect, so I ask the Spirit to give me wisdom to meet the person where they are. Now that you’ve been in a pastoral role for a few years, what’s a piece of advice you’d have for any of our readers that may be feeling the call to be a pastor? Be faithful in whatever you are doing now, even if it’s small. I’ve met some people who get caught up in the desire to be a pastor some day, but neglect the things that are in front of them now. When I was 13, my youth pastor let me join the worship team because I came early every week to help set up chairs. Be faithful in a few things, and you’ll be made master over many. Beyond that my advice is to follow Jesus. I know it sounds cliché, but it is as simple as that. Follow Him and love Him and He will take care of the rest. Week after week pastors all over are supporting and leading their congregants. And Pastor Ben, I know I for one have been so blessed to be under your leadership and church service. So to round us off, how can we, as congregants, better support and pray for our pastors? Yes, more prayers please! That is so important. The other thing may come as a surprise, but I think it’s important for congregations to remember that their pastors are not better or more spiritual than them. When congregations start putting their pastor on a pedestal it is really unhealthy for everyone. This is most obvious when we hear of a Christian or pastor that has a moral failure. We probably shouldn’t be so shocked, because they are humans in need of a savior just like everyone else. We all have a role in the body of Christ and no one is better or more important than another. We only have one head: Jesus, not the pastor. Thank you so much for taking the time for this interview, Pastor Ben! It’s been fun and enlightening to get to hear more about life as a pastor. Do you have any thoughts or questions on being a pastor or pastoral ministry? Post in the comments below and we’d love to get back to you! Check out our next Ask a… post and if you have someone you want to be interviewed, send a note to blog@middle-kingdom.flywheelsites.com.